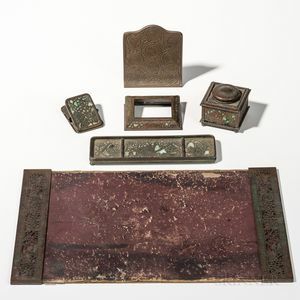 Six Tiffany Studios Art Glass and Bronze Desk Items, New York, c. 1912, four pieces in the grapevine pattern: calendar frame no. 930, inkwell no. 845, and a pen tray and paper clip (both with cracked glass), clip no. 971 (some with minor metalwork breaks), frame 3 1/2 x 4, inkwell ht. 3; a pair of blotter ends; and a single Zodiac pattern bookend marked "Tiffany Studios New York 1001," ht. 5 3/4 in.